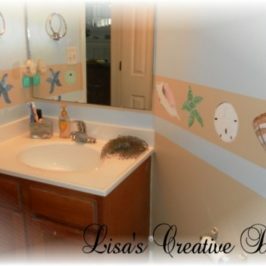 Have you ever wondered How to Dress Up A Boring Bathroom Mirror? 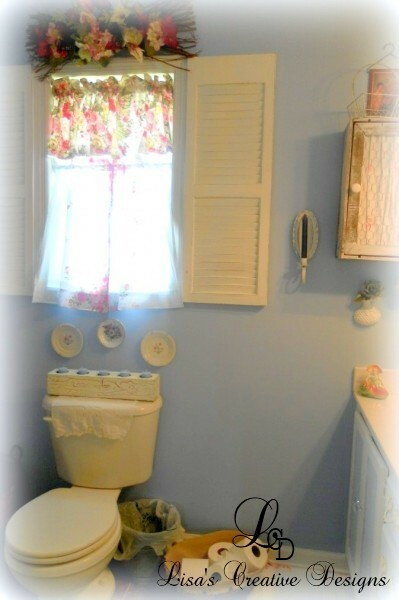 A couple of years ago I redecorated my master bathroom in a Shabby Chic Cottage Style theme. 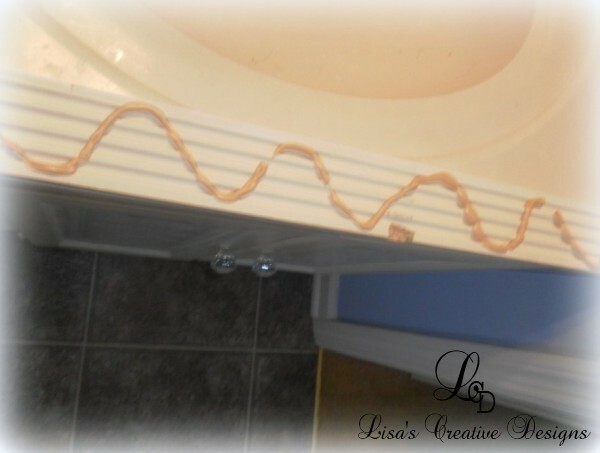 Today I want to travel back in time and revisit an easy DIY project I completed in that bathroom makeover. 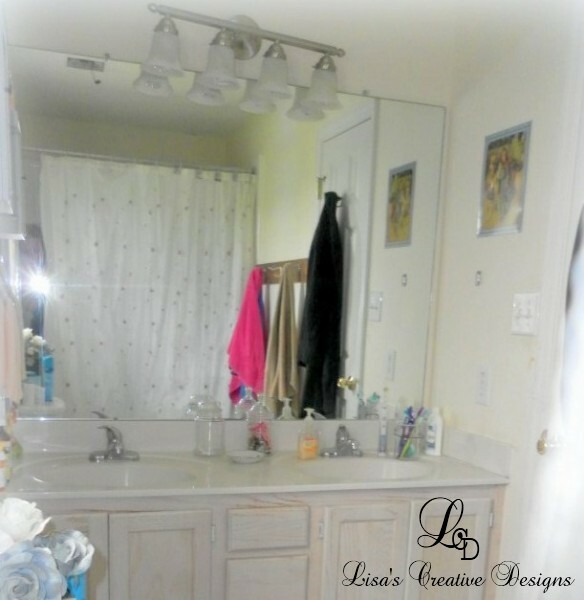 I am afraid many home builders grace our bathrooms with the presence of a large, nondescript, stock mirror above our sinks like the one in this “before” photo…. Talk about “No Imagination!” When I was redesigning the master bathroom I decided I wanted to spruce up the mirror and give it some warmth and character. I am pretty happy with the results. 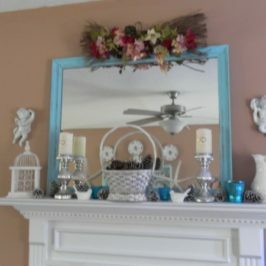 To add some charm to this mundane mirror, I went to my local Home Improvement store and purchased a few fluted White Polystyrene Molding and four wood rosettes. I took my measurements, cut each molding piece to size and added mirror adhesive to the back of each piece. (You can usually find this right near the mirrors in the store.) I started with a rosette in the left top corner of the mirror. 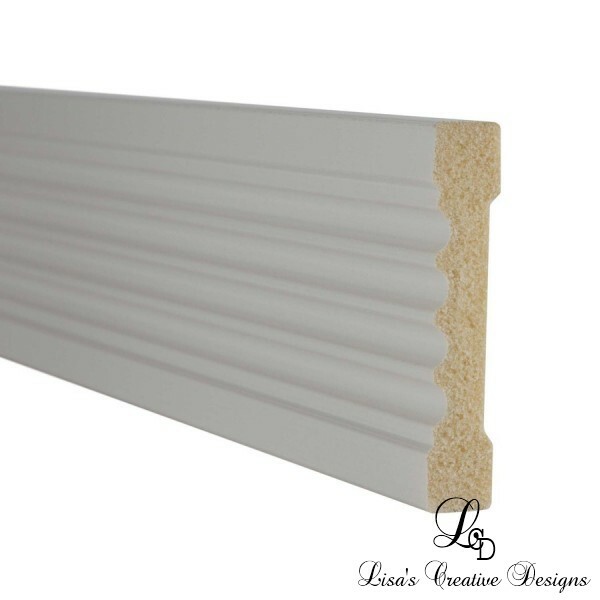 This adhesive sets really quickly so work with only one piece at a time. Add your adhesive then immediately place the piece directly on top of the mirror, lining it up with the edges of the mirror. 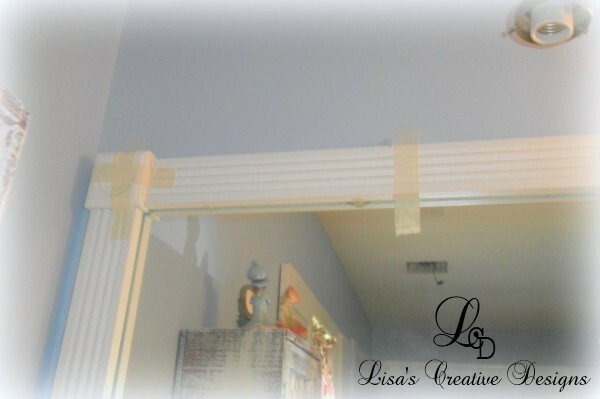 Secure it with masking tape or painter’s tape. 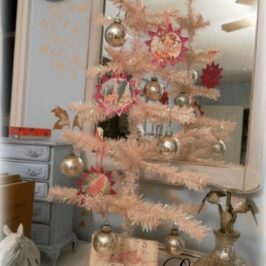 Go around placing your molding around the perimeter of the mirror, using the edges of the mirror as a guide and place the rosettes in the corners. The molding and rosettes came already painted white so I just did a quick coat of white paint over the whole thing to freshen it up. 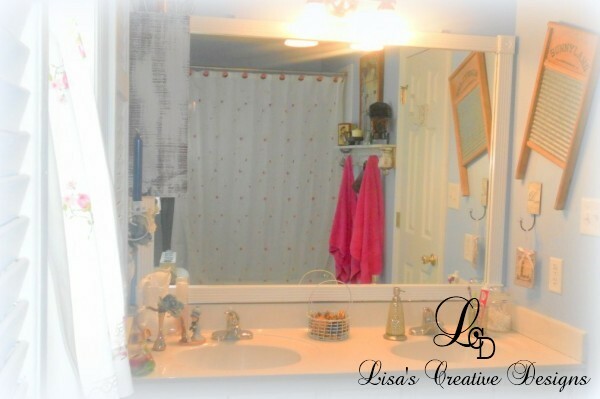 Now you know how to dress up a boring bathroom mirror…on a budget! This whole project cost me less than $50 and I love the new look. 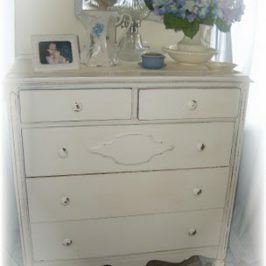 A once stark, naked mirror now has a touch of class! Do you know what I can use that will let me remove it when we move with out damaging the mirrors. It is not a sheet mirror. I have 2 of those medicine cabinets side by side with a separation of about 4 inches in between the 2. Not to shire that would hold well?